Shop Small is back! If you have an American Express credit or charge card (unless it is a Lloyds Avios one), you can make big savings on your Christmas shopping from tomorrow (Saturday) until 16th December with ‘Shop Small’. 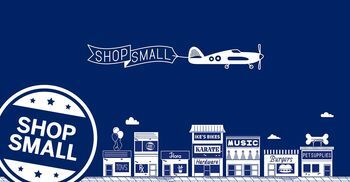 American Express is the major UK sponsor of a scheme called ‘Shop Small’, designed to encourage you to shop in local independent stores instead of major chains. Starting on Saturday and running until 16th December, you will receive £5 cashback on EVERY transaction you make for £10 or more at a participating ‘Shop Small’ business. There are very few rules apart from the fact that you can only get one £5 cashback per shop per card. You can, of course, register multiple American Express cards if you have more than one. You MUST register your credit or charge card before making a ‘Shop Small’ purchase. You can register British Airways, Harrods, Costco, Starwood, Gold, Platinum, Platinum Cashback, Amex Rewards and Green American Express cards by going to the American Express website, logging in and looking under ‘My Offers’ on the statement page. Note that Corporate and pre-paid Amex cards do not qualify. Lloyds Avios Rewards cards are also now blocked. You can register supplementary cards (an additional card held by your partner on the same account) as long as it has a different card number to your main card and has its own separate Amex log-in. The main Shop Small site is amexshopsmall.co.uk which contains a link to an interactive map where you can find participating shops in your area. You will also often see a Shop Small sticker in a shop window. Beware that this map, in previous years, has not been accurate. Often in a good way (some shops not featured give the credit) and often in a bad way (shops on the map are closed or don’t even accept Amex). Your best option is to use your Amex whenever you can during the Shop Small period and see what hits. One of our readers made his own shop small map last year, ShopSmallCrawl, based on actual experiences in London, which you can check out here. It is worth noting that it is not just sellers of ‘things’ who are taking part. You will find cafes and even the occasional pub taking part! You can make one purchase per registered card per shop that is taking part in ‘Shop Small’. You should receive an email or phone notification soon after making your purchase, although you shouldn’t panic if you don’t. A £5 credit for every £10 purchase will be added onto your credit card statement within a few days. For clarity …. this promotion is fully funded by American Express as part of its campaign to encourage more small shops to accept the card. It is not funded by the shop so you shouldn’t feel guilty about taking part! The premier stores shops are included in this shop small promotion, can I use my card in different premier stores and get £5 back each time ? There are 3 stores in Lincoln. Yes, each card is valid once per location. The Mrs wants a few items from JKC who have two central london branches as well as an online shop. Does anyone have any evidence of shop small working with online purchases with a particular retailer? Does anyone know if it works at the Ginger Pig? Also, if a retailer has more than one shop would the offer work separately at each one? It did for me at Borough Market branch, and it should at the different branches (I think). Thanks Cat. If anyone lives in Sussex the Horsham Celar is a very good wine shop taking part. Happy to split across multiple cards if he’s not busy.